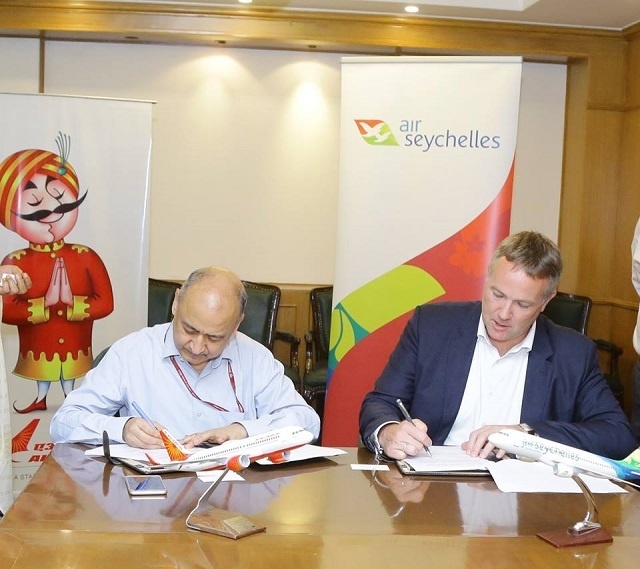 (Seychelles News Agency) - Air Seychelles and Air India are now offering travellers enhanced connections on their respective networks following the signing of a codeshare agreement between the two airlines on Thursday. The Seychelles’ national airline said that under the agreement, Air India will place its "AI" code on Air Seychelles regional services between Mumbai to Seychelles and Johannesburg. In return, Air Seychelles will place its “HM” code on Air India’s domestic services to eight cities -- Ahmedabad, Bangalore, Kolkata, Kochi, Delhi, Hyderabad, Chennai and Trivandrum. The code will also be used on Air India’s international services between Mumbai and Bangkok. “Our vast domestic network will ensure a seamless travel experience from all parts of India to the direct flight between Mumbai and Seychelles. We are indeed excited about this alliance,” added Kharola. Althuis also announced that Air Seychelles will be providing an additional 544 seats per week between Seychelles and Johannesburg as of December 10 to accommodate the growing demand over the upcoming winter and Easter period. The announcement comes five months after the Seychelles’ national carrier said it will increase the frequency of its services between Seychelles and Johannesburg to six flights per week starting last July. Air Seychelles -- established in 1978 -- currently operates five flights per week between Mumbai and Seychelles on Wednesdays, Thursdays, Fridays, Saturdays and Sundays. It has been serving India's financial, commercial city of Mumbai for nearly four years since the launch of its direct flights in December 2014. The airline also offers international flights to Abu Dhabi, Johannesburg and Mauritius and offers more than 350 domestic scheduled flights a week throughout the island nation.